We often tell our patients that the treatment of anxiety is primarily through psychotherapy, in contrast to the treatment of mood disorders which is often based on medications or brain stimulation. In fact, it is one of the more frustrating aspects of psychiatry that there has been so little progress in terms of the biological treatments of anxiety and fear disorders. An article in the American Journal of psychiatry in September 2016 proposes that the most common biological model of fear and anxiety is seriously flawed and that this might relate to the fact that so little progress has been made in treating fear and anxiety disorders with medications. The authors note that this model is founded on the understanding of the circuitry involved in escape behaviors in animals which clearly seems to be mediated by circuits connected to the amygdala and other parts of the limbic brain. They note that treatments that focus on modulating the circuits (that involve for instance moderating responses to cortisol releasing factor) have had disappointing results in clinical trials. 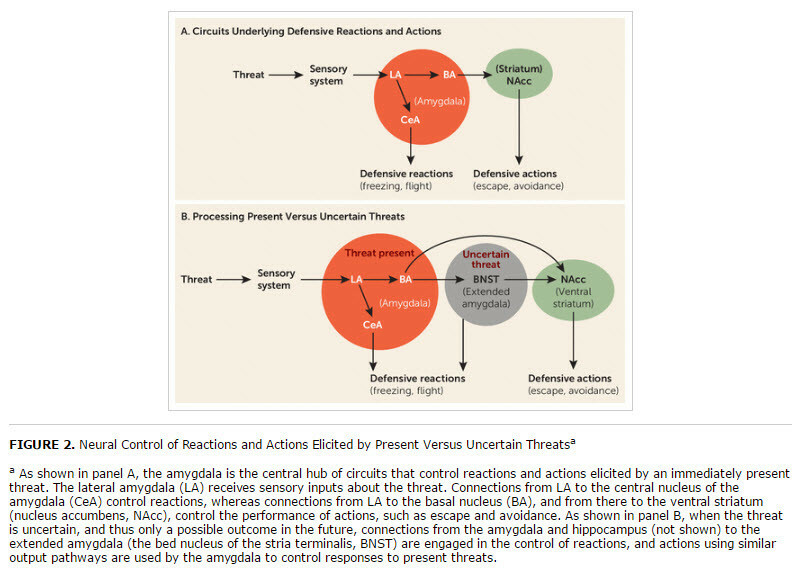 In animals these treatments have profound impact on fear behaviors, but in humans, although the same effects can be shown in activity in the limbic part of the brain, these medications have not been associated with significant reductions in fear and anxiety symptoms. In fact this is been one of the great disappointments for the pharmaceutical industry. 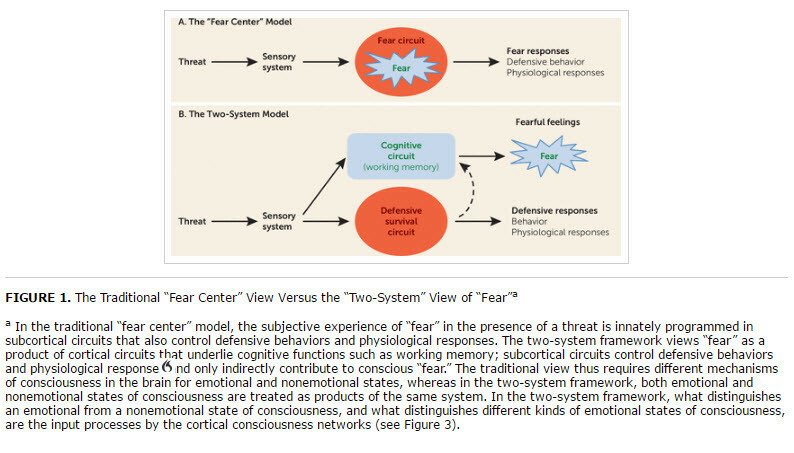 The authors propose that this is because there are two circuits in the brain that are involved in the experience of fear and anxiety in humans. One is the sub cortical circuits that are shared by humans and other animals. These mediate response to what they call “present threats” meaning threats that are visible in the moment. The lion on the left is an example of the present threat. Most of us don’t run into many of these in our lives these days. The other set of circuits are cortical circuits that are involved in self-consciousness and self awareness and that relate to the types of things that cause anxiety and fear in most of us, most of the time. The fear of our boss, or of disapproval by others, or of physical illnesses. The lion boss on the right is an example of the type of things that are associated with anxiety and fear for most of us most of the time. If you think about it for a little bit this theory makes a lot of sense. For example it can explain why it is that humans actually seek out experiences that are associated with activating the sub cortical fear circuits. Anyone who was ever written on a roller coaster or gone to a scary movie knows that these experiences are not nearly as disturbing and disruptive as the nighttime fear of some mysterious illness. In the picture below you can see a description of this model. And in this picture you can see the relationship of the two components to what are called “present threats” as opposed to the type of fears and worries that preoccupy most of us. 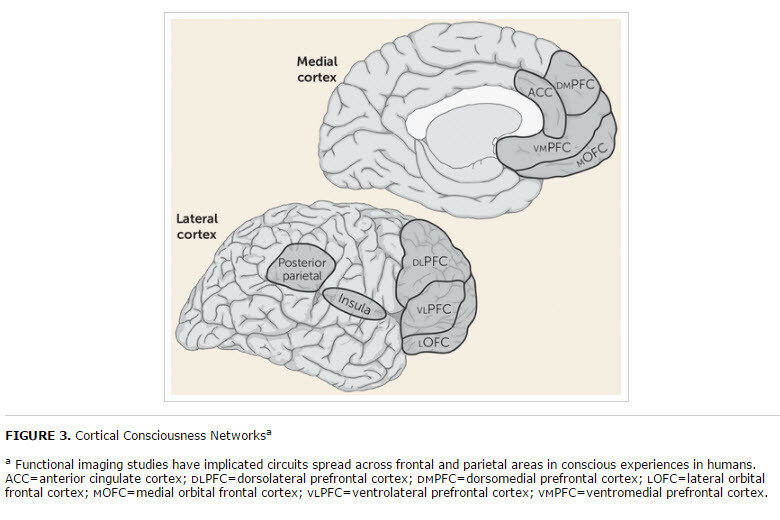 As the authors point out, the cortical circuits involved in anxiety and fear are probably the same circuits involved in self-awareness in general, and the picture below shows those areas of the brain. The entire article is very well written and certainly worth getting a copy of. See the reference below.